Sessions Attacks Marijuana Legalization Again. 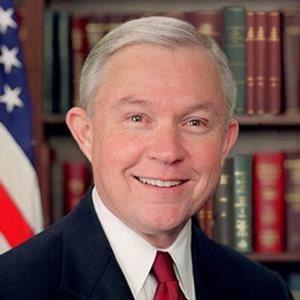 "I've never felt that we should legalize marijuana," Sessions said Wednesday in San Diego in remarks reported by Reuters. "It doesn't strike me that the country would be better if it's being sold at every street corner," he added, noting that it remains prohibited under federal law. But despite the attorney general's repeated anti-legalization comments, the Justice Department has yet to move seriously against states where it is legal. Last week, Deputy Attorney General Rod Rosenstein said the Cole memo, which set the Obama administration's largely laissez-faire policy toward legal pot states, is now under review. Maine Legislators Propose Online and Drive-Through Pot Sales. Proposed regulations from the legislature's marijuana committee would let adults buy pot over the Internet and at drive-through windows at licensed pot shops. The rules are not yet set, however, and opponents are seeking to tighten access. Stay tuned. Las Vegas Gets First 24-Hour Pot Shop. The city council voted unanimously Wednesday to allow a pot shop, Oasis Cannabis, to stay open 24 hours a day. It will be the first 24/7 pot shop to be located near the Strip, but other pot shops in nearby North Las Vegas are already open around the clock. In approving the move, the council overrode its own city code, which requires pot businesses to shut down between 3:00am and 6:00am. Kentucky Court Dismisses Lawsuit Aimed at Governor, Attorney General. A lawsuit filed against Gov. Matt Bevin (R) and Attorney General Andy Beshear (D) seeking to force them to legalize medical marijuana in the state was thrown out Wednesday. A Franklin circuit court judge ruled that legal precedent makes it clear that only the legislature can regulate the use of marijuana in the state -- not the executive branch and not the courts. CVS to Limit Opioid Prescriptions in Bid to Address Crisis. The national drug store chain announced Thursday it will take steps to limit initial prescriptions to seven-day supplies for new patients facing acute pain. It will instruct pharmacists to contact prescribing doctors if they see prescriptions with what they believe are more opioids than necessary. The chain will also cap daily dosages and require new patients to get medications that offer short-period pain relief instead of longer duration ones. CVS did not address how the moves would impact patients suffering from chronic pain. Nevada Governor Sets Opioid Task Force Meeting. Gov. Brian Sandoval (R) has announced that the state's task force on opioid abuse is set to meet Monday. He said the task force will hear updates from state and federal agencies on their progress in fighting opioid abuse. The task force has already made the overdose reversal drug naloxone available to first responders, Sandoval noted. lIllinois Governor Signs Civil Asset Forfeiture Reform Bill. Gov. Bruce Rauner (R) signed House Bill 303 into law on Tuesday. The new law does not end civil asset forfeiture, but raises the bar for seizures, mandates the collection and reporting of seizure data, and imposes new sanctions for abuse or violations of asset forfeiture rules. Under the new law, the government's burden of proof standard rises from probable cause to a preponderance of the evidence. The law also provides that possession of small amounts of drugs will no longer be a legal basis for forfeiture. Duterte Tells Cops to Kill His Own Son if Drug Smuggling Rumors Are True. In a not very reassuring effort to demonstrate that his own family is not above the law, Philippines President Rodrigo Duterte said in a speech Wednesday that police could kill his children if they prove to be involved in drugs. The remarks came amid reports that his 42-year-old son Paolo was involved in drug smuggling. According to the Sydney Morning Herald, Duterte said he warned his son: "My orders are to kill you if you are caught, and I will protect the police who kill you." That way, people wouldn't think the first family was getting special treatment. "That's better ... so I can say to the people: "There, you keep talking. That's my son's corpse,' he said.